S&P Capital IQ equity analysts have a positive fundamental outlook on the influential Integrated Oil & Gas sub-industry, as well as most of the sector’s other smaller sub-industry groups. We believe that oil prices will decline slightly from current levels, averaging $91.96/bbl. in 2012 and $89.51 in 2013 as global economic growth slows. The Capital IQ consensus sees Energy sector EPS rising 11.2% in 2013 versus an 11.9% gain estimated for the S&P 500. According to Capital IQ, the sector’s recent valuation of 12.3X consensus estimated 2012 EPS is below the 500’s P/E of 14.0X, as oil price volatility keeps investors from assigning the sector too high a valuation, in our view. The sector’s P/E-to-projected five-year EPS growth rate (PEG) ratio of 2.1X is above the broader market’s 1.2X. This sector’s marketweighted S&P STARS average of 4.5 (out of 5.0) is above the S&P 500’s average of 3.8. The S&P GICS Energy Index sector has advanced right up to key trendline resistance off the April 2011 highs, and therefore, we believe there could be a pullback in the near term. In addition, prices have rallied into the beginning of a heavy layer of overhead supply that runs from 540 to 570, and we think this resistance may also keep a ceiling on prices in the short term. Both WTI and Brent are either at or very near large areas of overhead supply so we think oil prices could pause or correct. In addition, the COT (Commitment of Traders) data is showing high levels of bullishness for crude oil from large speculators (“dumb money”) and high levels of bearishness from commercial hedgers (“smart money”). Relative strength versus the 500 has bounced nicely since June, but the RS line remains in a downtrend off the April 2011 top. The stocks listed below are all Bullish and priced below their fair value. DK Delek US Holdings Inc.
SXL Sunoco Logistics Partners L.P.
As the earnings season continues to look good, many dividend stalwarts are increasing their annual dividend payouts. There are many companies increasing dividends but not all are stocks to buy. I used the equity summary score, a consensus of financial analysts at different firms, to determine that these stocks are rated Bullish or better. For investors seeking dividend income, these stocks make great additions to your portfolio. Coach (COH) dressed up shareholders with a 33% increase in its quarterly payout to 40 cents per share. The new dividend will start being paid in July. The new dividend yield is 2.16%. The luxury handbag, accessories and leather-goods maker has seen its profit grow for over two years on the strength of its North American direct-to-consumer businesses and global expansion. The company also is broadening its men’s business with more male-oriented products and by opening men’s stores in the U.S. and Japan. COH has an equity summary score of 9.7 out of 10 for a Very Bullish outlook. International Business Machines (IBM) reprogrammed its dividend with a 13% increase to 85 cents per share. The new payout will be coded on June 9 to shareholders of record as of May 10. The new dividend yield is 1.64%. This is the 17th straight year that IBM has increased its quarterly dividend, and the ninth year in a row of double-digit-percent increases. IBM also authorized an additional$7 billion to buy back shares as the company looks to return more of its rising cash levels to shareholders. IBM has an equity summary score of 9.7 out of 10 for a Very Bullish outlook. Exxon Mobil (XOM) delivered a 21.2% boost in its quarterly dividend payment to 57 cents per share. The new payout will be made on June 11 to shareholders of record as of May 14. The new dividend yield is 2.65%. If Exxon Mobil’s CEO stays true to his word…and keeps the yield competitive, there should be further dividend increases before next year. The company has increased its annual dividend every year for the past 30 years. XOM has an equity summary score of 9.6 out of 10 for a Very Bullish outlook. Chevron Corporation (CVX) engages in petroleum, chemicals, mining, power generation, and energy operations worldwide. It operates in two segments, Upstream and Downstream. CVX unearthed an 11.1% increase in its quarterly dividend to 90 cents per share. The new dividend will start being paid in June. The new dividend yield is 3.39%. CVX has a significant amount of cash in its balance sheet –$18.9 billion at the end of first quarter. The company also announced it purchased $1.25 billion of its common stock in the first quarter 2012 under its share repurchase program. CVX has an equity summary score of 9.4 out of 10 for a Very Bullish outlook. Johnson & Johnson (JNJ) put a Band-Aid on its quarterly payout, increasing its dividend 7% to 61 cents per share. The new payout will be made on June 12 to shareholders of record as of May 29. The new dividend yield is 3.76%. This is the 50th straight year the health-care products giant has decided to raise its payout to shareholders. JNJ recently reported a higher first-quarter profit due to a foreign-exchange- related gain and lower expenses, though the currency impacts also weighed on sales. JNJ has an equity summary score of 8.4 out of 10 for a Bullish outlook. Grey and Vogel found that buying the cheapest 25% of stocks based on EV/EBITDA returned 17.66% a year from 1971-2010. This beat buying cheap stocks based on the P/E ratio, which returned just 15.23% a year over the same time. My idea is to apply the EV/EBITDA metric to dividend stocks. It makes sense to buy dividend stocks at a lower value which gives the investor higher dividend rate of pay while waiting for a stock price increase to a higher valuation. I am looking at stocks with a dividend yield of at least 3% and a return on equity of at least 10%. 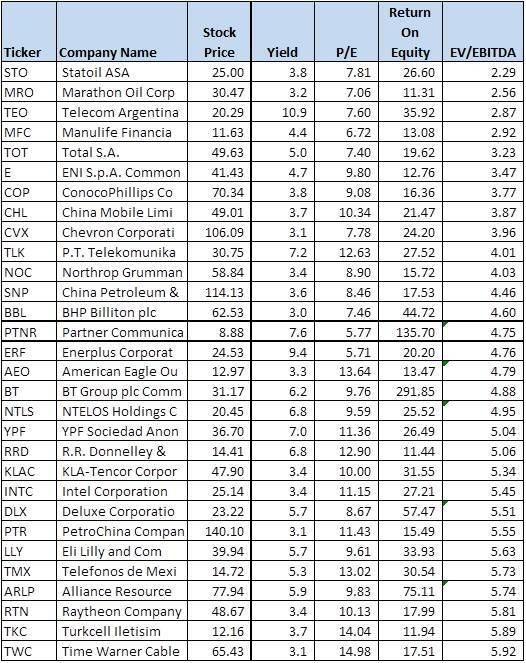 The table below shows the best stocks meeting the criteria along with their EV/EBITDA ratios. The list is loaded with companies in the oil industry with EV/EBITDA ratios below 5.0 such as: StatOil (STO), Marathon Oil (MRO), Total (TOT), ConocoPhillips (COP), and Chevron (CVX). Among this group, TOT has the highest dividend yield at 5.0% with an EV/EBITDA of 3.23. The telecom industry is well represented by companies such as Telecom Argentina (TEO), China Mobile (CHL), P.T. Telekomunikasi Indonesia, (TLK), BT Group plc (BT) and Telefonos de Mexico SA de CV Co (TMX). TLK has a 7.2% dividend yield with an EV/EBITDA of 4.01. S&P recommends marketweighting the S&P 500 Energy sector. Year to date through November 18, the S&P Energy Index, which represented 12.4% of the S&P 500 Index, was down 0.1%, compared to a 3.3% decline for the S&P 500. In 2010, this sector index advanced 17.9%, versus a 12.8% increase for the 500. There are seven sub-industry indices in this sector, with Integrated Oil & Gas by far the largest at 56.7% of the sector’s market value. S&P equity analysts have a positive fundamental outlook on the influential Integrated Oil & Gas sub-industry, as well as most of the sector’s other smaller sub-industry groups due to strong emerging market energy demand and tight global capacity. However, we believe that while oil prices will remain historically elevated, averaging $92.35/bbl. in 2011 and $95.53/bbl. in 2012, energy price appreciation will slow relative to 2010’s big advance owing to uncertain U.S. and European growth prospects. According to Capital IQ, the sector’s recent valuation of 9.8X consensus estimated 2012 EPS is below the 500’s P/E of 11.3X, as oil price volatility keeps investors from assigning the sector too high a valuation, in our view. The sector’s P/E-to-projected-five-year EPS growth rate (PEG) ratio of 0.8X is below the broader market’s 1.0X. This sector’s marketweighted S&P STARS average of 4.3 (out of 5.0) is above the S&P 500’s average of 3.8. The S&P GICS Energy Index has broken out from a bullish, inverse head-and-shoulders pattern. This suggests to us that the intermediate-term trend has turned bullish. However, prices have stalled up at the next area of formidable overhead supply in the 530 to 560 region. Prices have rallied back above their 17-week and 43-week exponential moving averages, a bullish sign, in our view. The 17-week has been rising since mid-October and is very close to retaking the 43-week exponential. A bullish crossover would be more confirmation that the longer-term trend is bullish. Relative strength vs. the 500 remains in a downtrend off the early April top; however, the RS line has rebounded nicely since the end of September, and is not far from breaking its downtrend. We have raised our technical opinion on the Energy sector to neutral with a bullish bias, from neutral with a bearish bias. In all, we recommend marketweighting the Energy sector based on our view that more subdued oil price appreciation offsets low valuations. Some of the notable energy companies making the list are well known such as COP and CVX. However, other energy companies offer high yield dividends such as LUKOY (7.4%), PSE (7.8%), REPYY (7.8%), YPF (10%) and ERF (8.9%). OAO Lukoil (LUKOY), together with its subsidiaries, engages in the exploration, production, refining, marketing, and distribution of oil and gas in Russia and internationally. EPS increased from $10.93 to an estimated $13.71 over the past 5 quarters indicating an improving growth rate. Analyst forecasts have recently been raised. Lukoil Oil Company’s stock price is down 11.1% in the last 12 months, down 10.7% in the past quarter and down 10.3% in the past month This historical performance should lead to above average price performance in the next year. The passing of 2010 marked a series of changes for Enerplus (ERF), as it converted from an income trust to a corporation. The company sold off conventional and oil sands assets, using the proceeds to build its acreage position in Pennsylvania’s Marcellus Shale and the Bakken in North Dakota and Saskatchewan. We think the company will continue to pay an attractive dividend and aggressively pursue production growth in the Marcellus and Bakken. ERFs development efforts in the Marcellus Shale should lead to strong production growth through 2015. 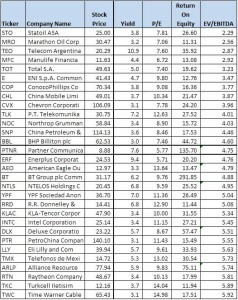 Here is a list of dividend payers in the energy sector ranked as very bullish or bullish by equity summary score worth a look for 2012. 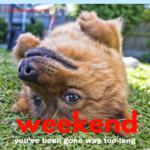 Last week the major equity indexes looked oversold and the chances looked good for a short-term rally. Surprisingly the only rally attempt came last Thursday and it was feeble at best. Most indicators are now even more oversold so chances are greater for an oversold bounce this week but still uncertainity in the month. With the current market pullback and more uncertainity, I am looking at writing calls below the stock price for a 5% or so downside protection. Below is the covered call trades for the July 2011 call options. You purchase 100 shares of stock and sell 1 call for the covered call trade. You can sell the at-the-money call (ATM) or you can sell one strike price below market price for a more conservative covered call. The table provides the prices and volatility for the ATM strike prices. Whole Foods Market, Inc. (WFM) is a natural and organic foods supermarket. The Company has one operating segment, natural and organic foods supermarkets. As of September 26, 2010, the Company operated 299 stores in the United States, Canada and the United Kingdom. Its stores average 37,600 square feet in size and nine years in age, and are supported by its Austin headquarters, regional offices, distribution centers, bakehouse facilities, commissary kitchens, seafood-processing facilities, meat and produce procurement centers, and a specialty coffee, tea procurement and brewing operation. As of September 26, 2010, the Company operated 299 stores, of which 288 stores operated in 38 United States, states and the District of Columbia; six stores in Canada, and five stores in the United Kingdom. It owns 11 stores, two distribution facilities and land for one store in development, including the adjacent property. Salesforce.com, Inc. (CRM) is a provider of enterprise cloud computing applications. The Company provides a customer and collaboration relationship management (CRM), service to businesses of all sizes and industries worldwide and provides a technology platform for customers and developers to build and run business applications. Cloud computing refers to the use of Internet-based computing, storage and connectivity technology for a variety of different services. The Company designed and developed its offering, which can be deployed, customized and integrated with other software applications. The Company delivers its service through the Web browsers. It markets its service to businesses on a subscription basis, primarily through its direct sales efforts and indirectly through partners. In May 2010, the Company acquired Jigsaw Data Corporation, a cloud provider of crowd-sourced data services in the cloud. In January 2011, it acquired Heroku, Inc. and Dimdim, Inc.
National Oilwell Varco, Inc. (NOV) is a provider of equipment and components used in oil and gas drilling and production operations, oilfield services and supply chain integration services to the upstream oil and gas industry. It operates in three business segments: Rig Technology, Petroleum Services & Supplies and Distribution Services. The Rig Technology segment designs, manufactures, sells and services systems for the drilling, completion and servicing of oil and gas wells. The Petroleum Services & Supplies segment provides consumable goods and services used to drill, complete, remediate and workover oil and gas wells, service pipelines, flowlines and other oilfield tubular goods. The Distribution Services segment provides maintenance, repair and operating supplies, and spare parts to drill site and production locations worldwide. It acquired Advanced Production and Loading PLC in December 2010. In January 2010, it acquired Ambar Lone Star Fluid Services, LLC. Anadarko Petroleum Corporation (APC) is an independent oil and natural gas exploration and production company. As of December 31, 2010, it had 2.4 billion barrels of oil equivalent of proved reserves. Anadarko’s portfolio of assets includes positions in onshore resource plays in the Rocky Mountains region, the southern United States and the Appalachian basin. Anadarko operates in three operating segments: oil and gas exploration and production, midstream, and marketing. Oil and gas exploration and production segment explores for and produces natural gas, crude oil, condensate and natural gas liquids (NGLs). Midstream segment provides gathering, processing, treating and transportation services to Anadarko and third-party oil and gas producers. It owns and operates natural gas gathering, processing, treating and transportation systems in the United States. Marketing segment sells much of Anadarko’s production, as well as hydrocarbons purchased from third parties. Avnet, Inc. (AVT), along with its subsidiaries, is an industrial distributor of electronic components, enterprise computer and storage products and embedded subsystems. It distributes electronic components, computer products and software as received from its suppliers or with assembly or other value added by Avnet. It also provides engineering design, materials management and logistics services, system integration and configuration, and supply chain services that can be customized to meet the requirements of both customers and suppliers. It has two primary operating groups: Electronics Marketing, which markets and sells semiconductors and interconnect, passive and electromechanical devices and embedded products for more than 300 electronic component manufacturers; and Technology Solutions, which markets and sells mid- to high-end servers, data storage, software and the services required to implement these products and solutions to the value-added reseller channel. Plains Exploration & Production Company (PXP) is an independent oil and gas company engaged in the upstream oil and gas business. The upstream business acquires, develops, explores for and produces oil and gas. Its upstream activities are located in the United States. The Company owns oil and gas properties with principal operations in Onshore California, Offshore California, the Gulf Coast Region, the Mid-Continent Region and the Rocky Mountains. As of December 31, 2010, it had proved reserves of 416.1 million barrels of oil equivalent, of which 54% consisted of oil and 57% was proved developed. Chevron Corporation (CVX) manages its investments in subsidiaries and affiliates and provides administrative, financial, management and technology support to the United States and international subsidiaries that engage in petroleum operations, chemicals operations, mining operations, power generation and energy services. Upstream operations consist of exploring for, developing and producing crude oil and natural gas; transporting crude oil by international oil export pipelines; transporting, storage and marketing of natural gas, and a gas-to-liquids project. Downstream operations consist of refining of crude oil into petroleum products marketing of crude oil and refined products. In September 2010, the Company completed acquisition of operating interests in three deepwater exploration blocks in the South China Sea’s Pearl River Mouth Basin. In February 2011, Chevron completed the acquisition of Atlas Energy, Inc.